I have a bit of a Chicago-style potty mouth–it’s where I was born and raised–but that’s the only real giveaway that I’m not a total rule follower. I like things orderly, I like accountability, I like design and flow to be smart. Growing up, I followed orders. I liked my clothes to match. I got good grades. My teachers, coaches, and later professors would have likely used words like “organized,” “responsible,” “mature,” and “hard-working” to describe me. I graduated with honors out of college and onto the next logical path that I was groomed for–internships. Then it was on to full-time employment with a large consumer packaged goods firm working in category management. I was quickly promoted through the ranks and soon in charge of leading others. I write this not because I think I’m all that different from the millions of other professionals out there. Many of us are great at the numbers side of things; we understand the nuances of business communication, and the navigations required there. We are also tenacious, desire challenge, and seek to elevate our leadership potential. If you are all of those things, then likely you have risen up the corporate ladder and enjoyed success–maybe even real and true fulfillment. And I’m not talking about the, “look at me, look at all my stuff” kind of fulfillment that we see so much of. I’m talking about going to bed at night thankful and feeling 1) blessed every time you lay your head down for the chance to be in your role and 2) also waking up excited about the possibilities of what is in store for your next day. If your answer is “yes” to both of those things, then you are among the lucky and you should read no further, do not press go, stay the course. What you have is precious. Are you on a corporate path, working for a great company with great people, but still feeling that itch day in and day out? Are you still feeling that there is something else out there and are wanting to write your own path or break all the rules? Are you wondering what could have been? If any of those things resonate with you, then let me stand on my soapbox for just a minute more. Several years into my corporate career that itch for more began as a feeling of unfulfillment. That feeling of unfulfillment accumulated slowly and then more and more as each passing day and month wore on. At times I felt guilty for feeling this way, particularly on the heels of a promotion or after receiving accolades or helping someone with a presentation that had resounding impact. I liked people and I liked helping people, but not within the confines of what I was doing or the structure I had to follow. The meaning and intention was true for me, but I felt like a phony because I knew it wasn’t what I wanted to be doing. I watched my husband, Brian, for many years as an entrepreneur with no formal degree make quite a bit more than me, call his own shots, use his creativity, and take risks. I think it was easy to tell myself for a long time that I was just the partner with the steady job and that being an entrepreneur wasn’t really my personality type. In hindsight, it was just a comfortable lie that I told myself for many years. The itch just kept coming back, begging to be scratched. I can’t describe to you how scary contemplating the idea of quitting my job to try something else felt, but deep inside I knew this was the answer. I’d let my feelings rock on for so long that I was quite miserable and feeling like I needed to jump ship without my next steps perfectly laid out. While four months pregnant with our first child and with a very loose plan to explore franchise-purchase options with Brian, I quit my corporate job. Brian simply said, “We’ll still have our health, we’ll still have our family, we’ll just lose a lot of money.” Well, I felt that was frivolous to say. My husband’s entrepreneurial spirit, go-getter attitude, and risk-taking personality was what truly helped to walk me forward. My eyes became wide open to the possibilities of more and I was eager to enjoy this entreprenurial future with him. Once the decision was made, the lease signed, it actually got easier for me (but only by a little bit.) We had committed, we were focused, and we were ready to make Wake Foot Sanctuary a success. When you finally make that decision for yourself, there is really no other choice but to follow through on your plan. I close my eyes from time to time to take myself back into two places in my life: First, the feelings and emotions of the corporate life I was living and the itch that constantly gnawed at me. But also those first early days/weeks/months of owning Wake Foot Sanctuary and all the fears, mistakes, and early wins that came out of that time period. I couldn’t have been more “blissed out” starting from the ground up. I booked appointments, hired staff, cleaned toilets, and mopped floors. I like to remember those times in hopes that tapping into those feelings will help me better connect with how new franchisees will feel stepping out for the first time on this journey. I hold a reverence for those times in my life and a deep appreciation of what it all meant to get to where we are today. I can promise that if you have that itch, it will not go away until you scratch it. You might be able to ignore it or push it aside for a while but it will always come back. It’s a damn shame and a waste if you don’t scratch that itch. Apply the same gusto, the same go-get-it attitude that you give to everything else you have achieved. Surround yourself with people that shore up your gaps and be smart with your investments. Take it inch by inch. 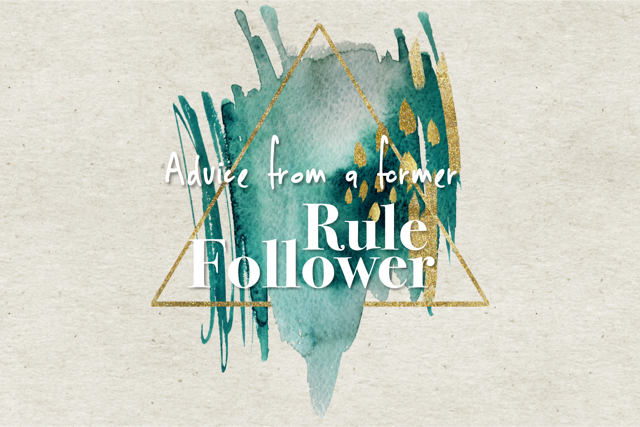 From one former rule follower to another, you can. This piece is written and published by Melissa Long who is the Founder & CEO of Wake Foot Sanctuary.